With the support of JICA and PREX and local governmental authorities, we have delivered presentations mainly in Asian countries about how Japanese SMEs become competitive. Our responsibility is to help SME achieve its management goals. 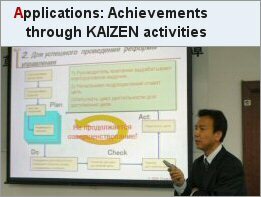 For this, we initiate KAIZEN activities where every single employee joins. Whatever the strategy is, it is the employees who execute and promote what is planned. Thus we put our eyes on employees motivation, skill and moral. Creation Co., Ltd. All rights reserved.